Hmm, what should we see today? This Gauguin in the Art Institute’s “From Cezanne to Picasso show?” More on that in a moment. What a week! It started with the Goodman’s superb production of August Wilson’s last masterpiece, “Radio Golf.” That play sings of our time, without music. His African-American characters – in the 1990’s – have lost their music. One gets a spot on the radio and he talks about golf! (Hence the name of the play.) The one time the two leads do sing is when they learn from the government that their neighborhood has been officially declared “blight.” They do an African-based dance and cry out ecstactically “blight! blight! blight!” Now for August Wilson to show African-Americans happy that their neighborhood is blighted, and that the U.S. Government thinks so, and to have his two characters be happy to work with the U. S. Government to get federal loans to build new housing to make money, is a strong condemnation indeed. Of course, things change in the course of the play. The set for this final play in the Wilson cycle picked up bits from earlier plays, nearly all of which are set in the Hill District of Pittsburgh. And one more note about the music, rather than singing the blues as August Wilson characters from earlier in the century do, these two jokers in “Radio Golf” sing “Blue Skies, ” sounding like a couple of frat boys. His 1990’s characters have for the most part lost their songs, which his play for the 1910’s “Joe Turner’s Come and Gone” warned against. The Goodman leased its smaller Owen Theater to Congo Square Theater for a take-your-breath-away “Joe Turner.” (Both shows closed Sunday.) When Herald Loomis is lying on the floor at the end of act one, “What you gonna do Herald Loomis?” because his feet won’t hold him, you can’t wait for intermission to end, to find out what he gonna do. And that great line at the end, I don’t want to spoil it but it’s about “shining like new money” leaves one speechless and hopeful. The cast was superb, particularly Allen Gilmore, as Bynum. “I binds ’em. But you can’t bind what don’t cling.” He embodied the shaman in his character, in ways that will make your hair stand end, like his. Kudos to the Goodman for producing exceptionally well all ten of Wilson’s plays. They’re the only theater in America to put them all on. And I look forward to the day when we’ll be able to see them in order, one after the other. There’s hardly a more important acheivement in American art. As I walked home from the Goodman I saw the back of our Picasso statue, then walked passed Bertrand Goldberg’s Marina City, Mies van der Rohe’s IBM building, the Wrigley, the Tribune Tower, all lit at night… What a city! thought I. The next day I feasted on the Joffrey Ballet in Louis Sullivan’s Auditorium Theater. Both took my breath away. The Auditorium always does, especially as it’s restored and regilded; the Joffrey also were also golden. Most especially their performance of “Les Presages,” Leonide Massine’s most beautiful marriage (in 1933) of Tchaikovsky’s Fifth Symphony to dance. The divine Maia Wilkins was possessed as Action. When she crouched down and stared at you with her cat eyes she looked like a leopard in the night. Wilkins was on fire. And the duo of Thomas Nicholas in black and Emily Patterson in a short red skirt danced Passion as if they were that. What a combination, he was structure, she was decoration, he was material she was wispy, one absolutely craving the other, they were thesis, antithesis and synthesis, dancing what is there and what is not there, which is what passion is all about. Temur Suluashvili left no choices when he appeared. He commanded the stage as Fate. The backdrop thrust forth the spiritual qualities of Kandinsky, in an energetic, color and action-filled canvas – 1930’s Russian and Bauhaus. The costumes picked up bits from the backdrop. So color and sound became one. And the dancers, moving to the music and wearing the colors also blurred all lines between color, sound and movement. With the strong lighting shining on them from the sides you had a scarily good dance. There was some inconsistency in the ensemble (I did not see the opening night cast). I didn’t love the version I saw of George Balanchine’s seminal modernist work “Apollo. ” Fabrice Calmels danced the lead – he’s extremely tall which should be a benefit, but he doesn’t dance with enough grace for me. A couple of years ago I saw the Joffrey dance “Apollo,” I think Calvin Kitten danced the lead, and he and it were superb. Fabrice always seems to be thinking about what to do next, as if the steps are not coming from his being. There’s a delay between intention and movement. So Fabrice made a fine Apollo, except when he moved. Only the opening, with April Daly as Leto giving birth to Apollo and Fabrice stumbling to learn to walk is stunning. I’m glad the Joffrey restored that scene to the dance after Balanchine excised it. (And glad the Joffrey helped preserve “Les Presages” and “The Green Table” too.) The end of “Apollo” is a knockout, when the gd ascends the steps to Olympus. When the ballet ended I walked to the back of the theater and up a flight of steps myself, to see what it felt like. To see the Joffrey in the Auditorium Theater, it hardly gets better than that. They closed with “The Green Table,” which is always a heart-shattering dance. Because we never learn the lessons of war. The Green Table is perfect for these crazed times, and I’m glad the Joffrey programmed it; alas as you know it debuted before World War Two and it couldn’t make people come to their senses then. The dancers had fun with the opening and closing scenes of diplomats, and then drove home the anti-war message beautifully. The soloists and the ensemble danced with conviction; the costumes, the lighting, even the haircuts! – all rang true. Michael Levine danced Death and he made me want to run away from him as far as I could. I hear Fabrice Calmels was quite good as Death as his height and deliberation benefits him in that role. The programming of what they call “Destiny’s Dances” (can’t they come up with a better title?) made a fascinating arc. It began with the early, nearly abstract, not very narrative “Les Presages,” to Balanchine’s “Apollo showing the birth of Modernism, to “The Green Table” – which is narrative, expressionist and very cinematic. 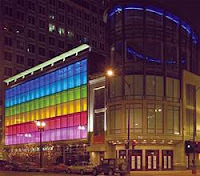 The Joffrey is touring, to PA, NY, Kansas City, Los Angeles and a few other cities. If they’re coming to your town, don’t miss them. But wait there’s more! Also Now Playing in Daleyville. “Far from Home: Photography, Travel and Inspiration,” twentieth century photographers working away from home. 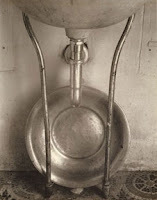 Nice to see lesser-known work by well-known photographers. And at the Art Institute is the miraculous “From Cezanne to Picasso, Ambroise Vollard, Patron of the Avant-Garde. ” 32 glorious, vibrating, yet soothing Cezannes; Gauguin’s “D’ou venons nous?” and a room or two full of Picassos. It’s room after room of masterpieces, from Russia, Paris, New York and local. So who could ask for more? 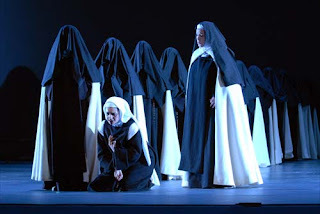 Oh, tonight I go to the Lyric’s Dialogues of the Carmelites. It’s supposed to be overwhelming. I’ll get back to you on that. to which my father and mother took me as a child, and in which I learned to love theater. It was designed by the man in whose summer bedroom I sleep, Howard Van Doren Shaw. That old Goodman is torn down, (shame on them!) they should have saved it, and I always wonder what happened to that paneling. Really, “Radio Golf” is about being authentic people. But most of us are not. And maybe that’s why we not only don’t live in authentic buildings, we tear down many that our ancestors have given us. What’s here and what isn’t. Sadly, August Wilson is no longer here, he has come and gone as they say. He died too young in October 2005, before he could finish polishing “Radio Golf,” but still able to say he completed his monumental achievement of one play about the African-American experience for each decade of the twentieth century. The best interview I ever lost was in 1995. I spent an afternoon with August Wilson, in the old Goodman Theater, as he observed rehearsals of Seven Guitars. He was still re-writing it, as he did ’til the end with his plays. My mini-disc machine failed and the beautiful, stimulating conversation I had with August Wilson was lost forever. Don’t know if you’ve been by the corner of Monroe and Columbus Drive lately. I hadn’t – until last night on my way to the Art Institute. Where once stood the stately – very stately – Goodman Theater — is now a large hole in the ground. The Goodman is gone. And aren’t we about to start a Mamet Festival soon? Many have Mamet memories, at the Goodman. Some of my strongest are August Wilson memories. Who remembers what the quote said engraved over the front door? Something about art being fleeting, or, “Oh enlighten thee all who enter here.” What was it again? Photo on the left shows the site looking west from Columbus Drive at Monroe. Above this will rise the new Modern Wing, of the Art Institute. Photo on the right is looking north, at the Sullivan arch from the Stock Exchange, in front of it was a garden and a fountain. The arch is shrouded in black, at the loss of its neighbor, the old Goodman Theater? It too remembers being torn down. 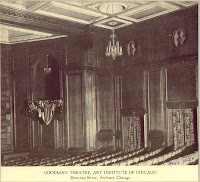 But I’d like to know why we tore down Howard van Doren Shaw’s Goodman Theater, which would have easy to save since it was mainly underground. And what’s this I spy? Oh, that’s from the School of the Art Institute itself. Which offers a Master of Science in Historic Preservation. Couldn’t save the old Goodman. The new Goodman, stands at 170 North Dearborn Street. (Complete with very tacky “Grand” staircase.) I know, I know, the offices are much better for the staff and the acoustics are better and there’s more flyspace. But I never saw a play at the fine old Goodman and said to myself, “Gosh, I wish they had more flyspace.” It was a classy place to listen to serious writing. Seems there’s no place for that anymore. And I always wondered, because the acoustics were bad, did that make you listen harder, and help you have the deep experiences so many of us had there? You are currently browsing the archives for the Goodman category.